The Cornelius Vanderbilt Scholarship Program began in 2007 with a gift from the Sartain Lanier Family Foundation of Atlanta designated to unite and strengthen Vanderbilt’s existing full-tuition academic merit scholarships under the aegis of a coordinated and cohesive scholarship program. The program honors the vision of Vanderbilt University’s founder, Commodore Cornelius Vanderbilt, who endowed the university in 1873 with a gift of $1 million to “contribute to strengthening the ties which should exist between all sections of our common country.” Cornelius Vanderbilt Scholars continue that mission, bringing intellectual and community leadership to the Vanderbilt campus where they forge interdisciplinary and interpersonal connections that unite people and ideas across the world. Cornelius Vanderbilt Scholars receive full tuition, plus a one-time stipend to be used towards a summer study abroad or research experience usually following their sophomore or junior year. Vanderbilt will provide additional need-based financial aid to those Cornelius Vanderbilt Scholarship recipients whose demonstrated need exceeds the amount of full-tuition. Scholarships are renewed each year as long as the recipient maintains at least a 3.0 GPA. Cornelius Vanderbilt Scholars have the opportunity to participate in a series of programs designed especially for highly talented students. To be considered for the Cornelius Vanderbilt Scholarship Program. Cornelius Vanderbilt Scholars are selected on the basis of academic achievement, intellectual promise, and leadership and contribution outside the classroom. In evaluating candidates, the selection committees review the entire application for freshman admissions along with the Cornelius Vanderbilt Scholarship application. Audition scores are a factor in merit scholarship selection for Blair School of Music recipients. 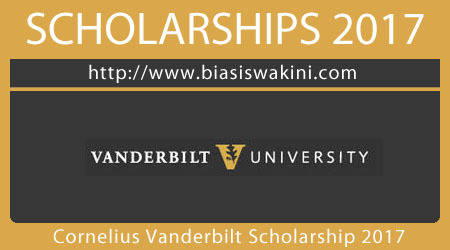 0 Komentar untuk "Cornelius Vanderbilt Scholarship 2017"